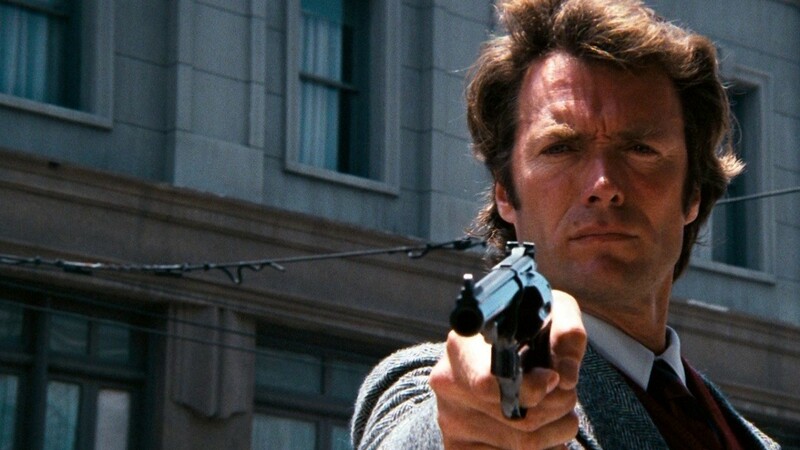 In a 2009 MTV poll, Dirty Harry was voted the “Greatest Movie Badass of all-time”… Not exactly an Academy Award, but nonetheless, Clint Eastwood’s maverick police detective “Dirty Harry” Callahan was to become one of the most beloved, immortal (and controversial) movie characters in cinema history. The film about a “bad-guy-killing, rules-breaking vigilante cop” was originally titled “Dead Right”. Released at Christmas time in 1971, Dirty Harry, filmed on a small budget of just $4M (about $22M today), became a box-office hit and lifted Clint Eastwood from the status of “cult figure” to a genuine movie “superstar”. Eastwood had a bit of luck on his side, not because he lacked talent or charisma, but only because the role of Dirty Harry was offered, and turned down, by so many other actors. The studio’s original choice for the role was Frank Sinatra. Unfortunately, Frank had injured his right hand eight years earlier while filming The Manchurian Candidate (1963) and was unable to wield the heavy gun Harry Callahan toted. Also, Sinatra’s father had recently passed away and he wanted, at the time, to do lighter fare. Marlon Brando’s name was brought up, although he was never actually approached. Paul Newman and Steve McQueen were asked and both said “no”. It was, however, Paul Newman who originally suggested Eastwood for the iconic role. John Wayne, Burt Lancaster, and Robert Mitchum all claim they too were approached for the role. Arch-conservative Wayne objected to the film’s “unjustified” and “glorified” violence. Arch-liberal Lancaster objected to the film’s right-wing politics and the violence in it. Eastwood only accepted the film on the condition that Don Siegel would be hired to be the director. Eastwood also liked the film being about “victim’s rights”, a subject he thought was being ignored at the time and wanted the film to bring it to the forefront (which it did). For the film’s villain, Eastwood recommended Andrew Robinson, a stage actor he had seen in a play called “the idiot”. Eastwood believed Robinson had “just the right unnerving character” to play the evil and psychotic “Scorpio”. Siegel agreed and loved Robinson because he “had the face of a choirboy”. Interestingly, Siegel’s original choice for the role was war hero Audie Murphy. He liked the idea of a national hero playing such a vicious killer. Unfortunately, Murphy was killed in a tragic plane crash on May 28, 1971, right before filming began. Robinson filled the role to a tee; during shooting, in the scene where Harry shows Scorpio his gun for the first time, Robinson ad-libbed the line “My, that’s a big one.” The crew broke up laughing at the ad-lib and the scene had to be re-shot; nonetheless, the ad-lib line remained in the film. It was writer John Milius who made a major contribution to the film by giving it its most immortal line. In an early scene, as Harry pulls his .44 magnum on a criminal, he says (in condensed form here) “did he fire six shots or five? Well, do you feel lucky, punk?” This statement soon became a classic signature line and was chosen by the American film institute as #51 on their “Most Memorable Quotes in Movie History” list. Harry’s other unforgettable line “Go ahead, make my day” was not actually in the original movie. It was recited in “Sudden Impact”, the 1983 Dirty Harry sequel. 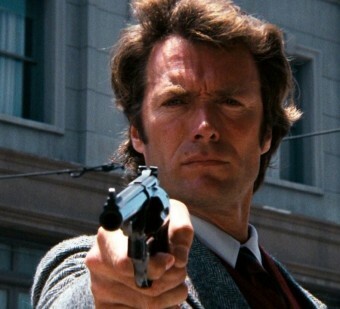 In the end, Dirty Harry is truly a landmark film, in many ways. Like almost every classic movie, its basic theme, ideas, and characters have been copied countless times over the years. For instance, the now-all-too-common scene of the “Maverick Cop” getting chewed out by his by-the-book superior because he “breaks all the rules” saw its genesis in Dirty Harry. One can understand the view of some about the film’s “excessive violence” and it can be said, quite fairly, that Dirty Harry (and it’s many sequels) are not for everyone. Nonetheless, Clint Eastwood, universally acknowledged as a fine director and a genuine film immortal, remains one of the finest slightly underrated actors of all-time (If you disagree, take another look at In the Line of Fire (1993) or Million Dollar Baby (2004) or The Bridges of Madison County (1995) or Gran Torino (2008). Or…don’t laugh…give Dirty Harry a second look. It would now seem apparent that when we look at this internationally famous superstar, we are looking at one of the finest all-around talents in the history of motion pictures. And yes, taste in movies is a subjective thing, but to us Dirty Harry lovers, this remains one of the most entertaining, well-made action movies ever made. Arnold Scwarzenegger once stated that he based his iconic characterizations in movies on “Dirty Harry”. He liked Harry’s “wise-cracking hero who was a law unto himself” character and tried to play that type of role in his films. Dirty Harry was banned in Finland for over a year. On the flipside, in the Philippines, a copy of the film was ordered to be used as a police training film. A “Dirty Harry” is now a slang term for a photographer (either a paparazzi and/or a model shoot) with a single lens reflex camera. A slang term for an SLR camera is a “.44 magnum”. The original draft of the script had the film being shot in New York, then Seattle, before finally settling on San Francisco. In real life, Robinson (Scorpio) was a devout pacifist and flinched violently every time he had to shoot a gun. Siegel actually had to have him go to a school to be taught to fire one. In an earlier scene in the film which took place in a bank, the script had Harry deliberately pointing his gun at his own temple and pulling the trigger, revealing that his gun chamber was not loaded. However, both Eastwood and Siegel thought the scene didn’t fit the character and excised the scene as being “too extreme”. This Dirty Harry scenario of the villain kidnapping a group of children in a school bus actually spawned a copycat crime. In Canada, two men kidnapped six children in their school bus, but fortunately the children managed to escape and both men were jailed. Incredibly, one of them was named “Eastwood”! absolutely love this movie. My kids have rented it from the library for the first time. New generation of fans! Going to look out for this movie to add to our home library.